FAQs - New to Paddling? Are you confused by the choice available and the terminology used? We have listed the most common questions asked on a daily basis below to help you. Please do not hesitate to contact us if you require any further assistance. Q: What's the difference between a Canoe and Kayak? A: I would be a rich man if I got paid a pound for everytime I have answered this question. Lets start by saying 99% of paddlers go Canoeing but 90% of them go Canoeing in or on a kayak! If you sit inside or on top of your canoe and use a paddle with a blade at each end of the shaft then you are probably paddling a kayak. These two images are of a sit-in kayak and a sit-on-top kayak. Note the twin-bladed paddle. 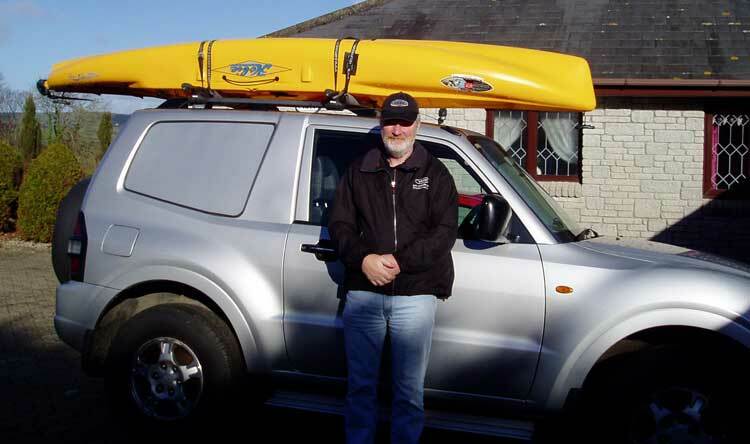 whereas kayaks are attributed to the northern peoples like the Inuits and Eskimos. 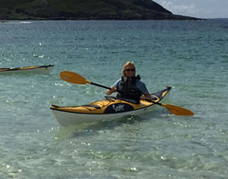 Q: What are the different types of Canoes & Kayaks? 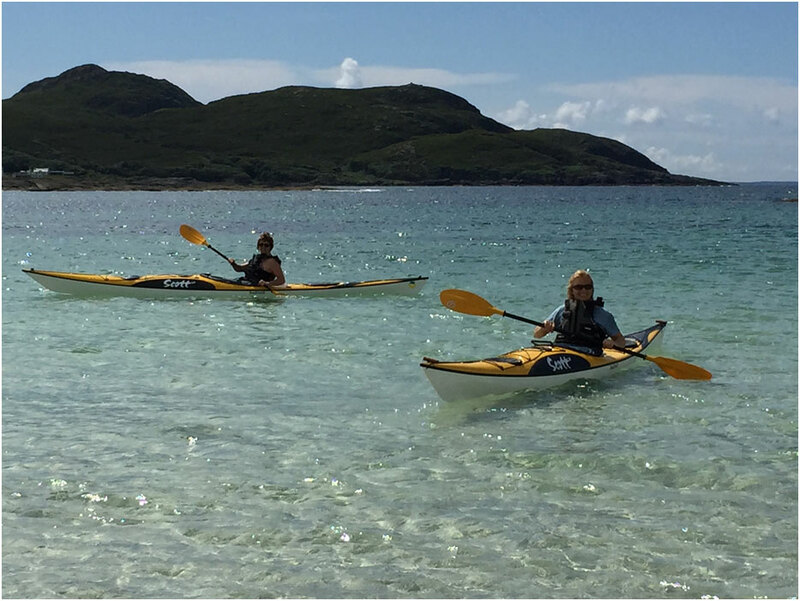 A: The range of modern canoes and kayaks means that there is no need to compromise in your choice of boat. There are different types of kayak, sit-on-top and canoe available for different types of paddling. 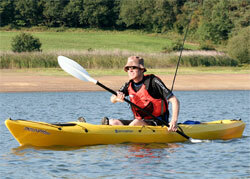 Our Types of Kayaks page explains the different types of canoe/kayak. Q: How to Transport / Store Canoes and Kayaks? 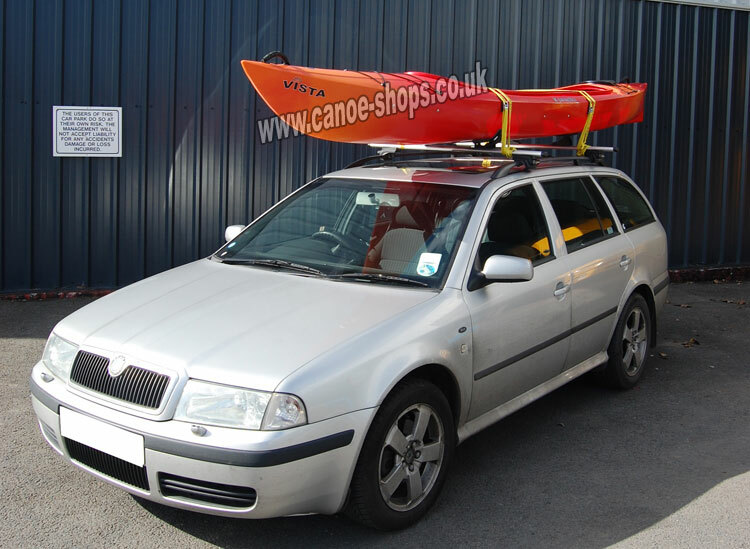 A: Most car roof racks can be fitted with a kayak carrier, kayak stacker or canoe carrier. Thule make the best canoe and kayak attachments for roof racks. Weight and size can be an issue and even more so if its windy. 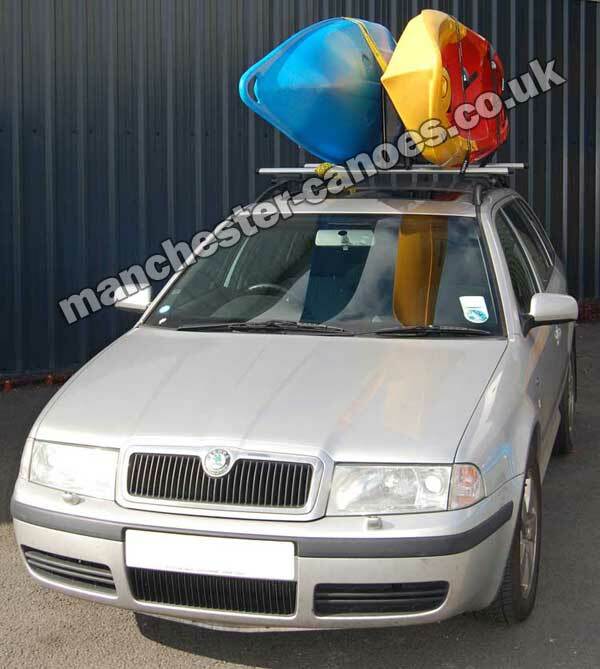 Manchester Canoes can demonstrate and supply a range of load-assisting products that make top loading onto your car much easier. canoe clubs and activity centers use purpose-built trailers that can load multiple canoes, kayaks, paddles and kit. The last few yards of the journey is covered by man- or woman-power, with a shoulder-hefted kayak or a trolley designed for the purpose. A few "Do Not's or you will be sad:"
Do Not over tighten the straps when car-topping the boat - tight enough is tight enough. Do Not use ratchet straps when car topping your boat - you will probably over tighten them and distort the boat. Do Not use Bungee Straps or you will lose an eye or your boat or both. The more money you have spent on your composite Valley Sea Kayak the more care you will take. Conversely, after slamming your Dagger Mamba into every bit of granite on the Upper Dart you may just dump it on the ground because you're exhausted. More generally if you can store your kayak on-end, that is the best way to preserve its shape. Next best is on its side with something stuffed under each end to help support its weight. Open or Canadian Canoes are best stored on their gunwales on trestles or dunnage blocks. Today's plastics are the best we have ever had for memory, abrasion resistance and impact damage resistance, and are all UV-stable. If you store you toy outside, cover it with a tarp of some sort as this will reduce any tendency for it to fade. Red boats head towards pink and green boats towards pale green but this takes a good few years. Place or fit supports for sea kayaks and touring kayaks so that they line up with the bulkheads if possible. Google "Airy Points" because no-one ever believes me when I tell them: always support your treasured craft on its Airy Points - even my staff don't believe me as they lack an engineering background. A few more "Do Not's or you will be even more sad!" Do not hang your plastic kayak under the garage roof (or anywhere else) by the bow and stern handles or grabs - eventually the plastic will split. Do not leave your Canadian canoe sat on uneven ground for lengthy periods - it will remember the shape of what you sat it on. Do Not store your canoes or kayaks on top of one another - you will distort the bottom ones. Do Not leave weighty objects on or in your canoe or kayak - you will distort it. Do Not store you plastic canoe or kayak in a boiler house - we know some who did and the boats changed shape all on their own. Do Not tow your Feelfree Gemini behind your quad bike - you will melt the wheel - this is not covered under the manufacturers warranty. The best maintenance is basically covered above - transport and store your canoe or kayak properly. A rinse with a garden hose in and out does no harm. Ratchet straps on kayaks used in salt water always suffer in time. A rinse with fresh water and a tiny squirt of WD 40 will help. Paddle around large rocks, avoid stoppers, be careful who borrows your boat etc etc. Buy a "Chinese Bargain" on Ebay made out of washing up bowl plastic and you can disregard most of what is written above - it will fall apart a few months after the warranty has expired - I'm not scare-mongering just saying it as it is. Q: Why are kayak paddle blades offset? A: The blades being offset is known as feathering. The reason behind this is that as the top blade is pushed through, it will encounter less air resistance. This is especially important whilst paddling into a headwind as often encountered when sea paddling or open water touring. Originally paddles would be feathered at 90 degrees for maximum efficiency. Modern kayak paddles for all-round or whitewater use have less feathering, typically 60 or 45 degrees. This is because there is less need to consider air resistance, less strain on wrist joints and a faster stroke rate. Modern sea/touring paddles will usually have an adjustable ferrule in the centre of the paddle, allowing the degree of feathering to be altered from anywhere between 90 and 0 degrees. This allows easy customisation of the paddle feather depending upon the paddler's preference and conditions.